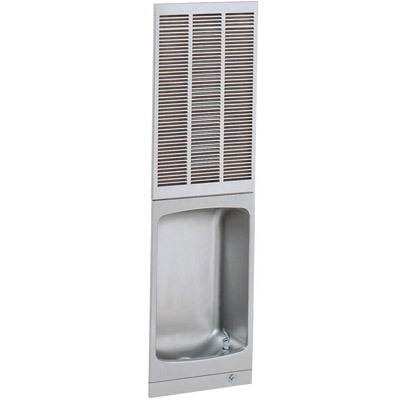 The Halsey Taylor BFMR-Q Water Cooler is a fully recessed, electric refrigerated wall-mounted unit. Delivers 8.0 GPH of 50°F water at 90°F ambient and 80°F inlet water. Constructed of non-corrosive stainless steel number 300 series with brushed satin finish. Fountain includes push-button valve on front, contourformed basin to eliminate splashing and standing water. Bubbler is chrome plated, two-stream, mound-building type. Cooling unit has a high efficiency positive start compressor using R134A, with pressurized counterflow cooling evaporator/chiller. When properly installed, unit meets state and federal requirements as defined by the Americans with Disabilities Act for both children or adults. Unit is certified to NSF/ANSI 61 and meets requirements of the Safe Drinking Water Act. Unit complies with ARI Standard 1010. These Water Coolers are certified to be lead-free as defined by the Safe Drinking Water Act. Halsey Taylor Water Coolers are manufactured with a waterway system utilizing copper components and completely lead-free materials. These waterways have no lead because all lead materials, such as leaded brass, have been removed. All joints are brazed using silver solder only. No lead solder is permitted. A strainer with an easily cleanable screen is provided to allow trapping and convenient removal of waterborne particulate of 140 microns and larger prior to their entry into the water cooler. One-piece, non-corrosive stainless steel cooler top, number 300 series with satin finish and contour-formed basin. Exclusive one-piece, chrome-plated two-stream mound-building bubbler with non-removable anti-squirt feature and integral hood insures a satisfying drink of water. Self closing, vandal-resistant pushbutton does not require grasping or twisting. Self-closing assembly is located inside unit to prevent tampering. Unit resists corrosion and liming. A constant stream height is automatically maintained under line pressures that vary from 20 to 105 psi. Easily cleaned in-line strainer screen traps particles of 140 microns or larger before they enter the waterway. Hermetically sealed, positive start compressor with lifetime lubrication and built-in overload protection, efficient capillary sizing, large capacity dryer-strainer, and self-lubricated fan cools copper/aluminum condenser. System uses R134A refrigerant. Protected by Halsey Taylor’s Limited 5 Year Warranty. Mounting frame is manufactured of corrosion resistant, galvanized steel. Open construction designed for ease of installation. Mounting frame can be shipped in advance for rough-in installation. Cooling unit contained in a heavy gauge galvanized steel cabinet with front and rear panels removable for service. The upper louvered panel is easily removable for access to the chiller unit system.